Publish moving images using modern Web standards. Is there a better alternative to Radi? Is Radi really the best app in Animation category? Will Radi work good on macOS 10.13.4? 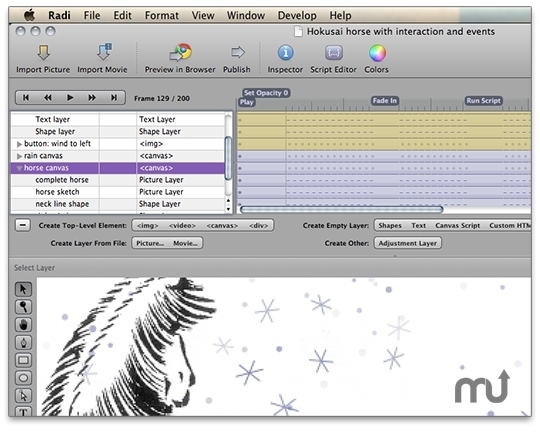 Radi is the Mac application that lets you create visual web pages in full motion. Radi now integrates with a web publishing service called See.io. It offers one-click publishing, data collection, and more. The service is created by the same author as Radi. Fixed issue with changing text layer's font using font panel on OS X 10.8 Mountain Lion. Fixed small UI issues with timeline. Radi needs a rating. Be the first to rate this app and get the discussion started!